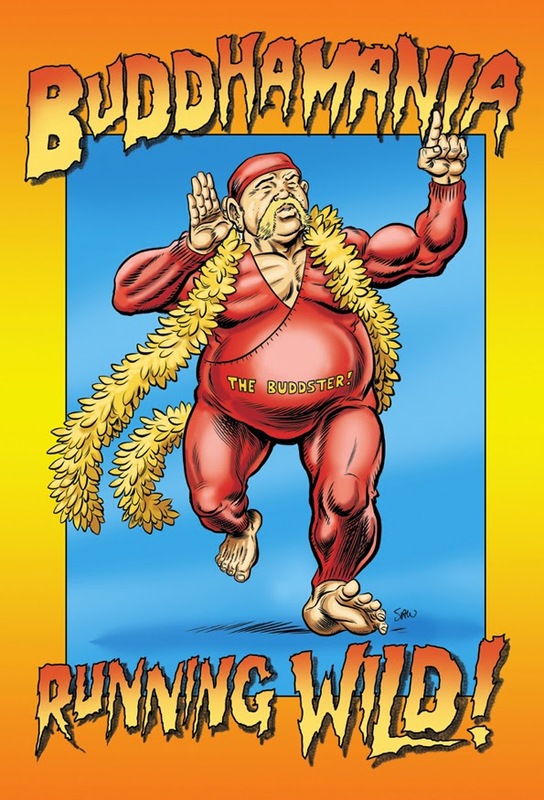 Simon Williams Comic Artist: Buddhamania... Running WILD! This past year I was honoured to have my work featured in various publications (see yesterday's SAVAGE DRAGON/MARS ATTACKS JUDGE DREDD), including a pin-up drawn for and featured in Renegade Arts TALES OF THE BUDDHA BEFORE HE GOT UNLIGHTENED graphic novel by Alan Grant (Judge Dredd, Doomlord, Batman) and my dear friend Jon Haward (Spectacular Spider-man, Dan Dare, Judge Dredd). Published by Renegade Arts Entertainment, this book is a one-of-a-kind! Not for kids and full of adult humour, it has the Buddha traveling around the world on his road to enlightenment, where he encounters the likes of Hercules, Nefertiti and even Elvis! The artwork inside is stunning... I know for a fact that Jon put heart and soul into this book, and it deserves to be a big hit (as big as the Buddha himself)! As for my pin-up, it was inspired by the one and only Hulk Hogan and my impromptu impersonation of him at the Auto Assembly Transformers conventions! Available online and at all good comic shops... be sure to pick it up! As a great man once said: "WHATCHA GONNA DO WHEN BUDDHAMANIA RUNS WILD ON YOU!!"